A throwback to the '80s when we were spending many hours with Alex Kidd on the Master System and Gain Ground at the arcade. Relive those memories with their launch today as part of the SEGA AGES lineup on Nintendo Switch! Thursday, March 28, 2019 — IRVINE, Calif. - March 28, 2019 - Alex Kidd in Miracle World and Gain Ground are now available for the Nintendo Switch™ for $7.99 each. 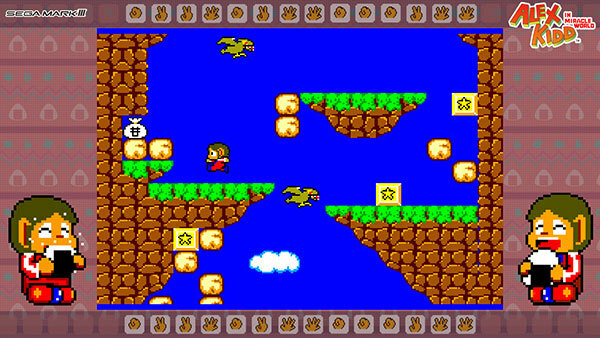 Put Alex Kidd's rock-crushing fists to the test in this SEGA AGES release containing several quality-of-life improvements including a Rewind option to make the game more accessible. Meanwhile, Gain Ground gets an arcade-faithful version featuring an All-Member Mode that unlocks all 20 characters, along with a three-player local multiplayer option. Build your SEGA AGES collection by picking up both titles today! SEGA Games History: Alex Kidd in Miracle World and Gain Ground Facts Since Alex Kidd in Miracle World and Phantasy Star share some of the same development staff, many references from the former appear in the latter. For example, the Psycho Wand in Alex Kidd is wielded by Lutz in Phantasy Star. The characters Egle and his fiancé (Princess) Lora are also the names of the main characters in Pit Pot, an action game for the Sega Master System. Gain Ground was known for its impressive level of detail for the time. While most arcade and SEGA Genesis titles ran at 320x224 resolution, Gain Ground was presented at 496x384 resolution thanks to its powerful System 24 board. In the Japanese version of Gain Ground, Stage 4-8 featured a popular glitch (fixed in the American release) where the level wouldn’t end unless you proceeded with only a few of the rescued characters, forcing you to beat the game this way. Since the plot involved a tyrannical computer AI, many felt this was coincidentally canonical, so the glitch is enabled by default in the game’s settings. About Alex Kidd in Miracle World As Alex Kidd, you must go on a quest to return peace to the land of Radaction by defeating the evil Janken the Great, who sends his henchmen and monsters to thwart your progress. You must defeat them by participating in a game of “rock, paper, scissors” against his minions. With 16 different levels to conquer as you steadily make your way to Janken the Great, this platforming classic is sure to test your skills and your wits! When a battle simulation goes wrong, all the contestants inside the system have been taken hostage by androids that have been reprogrammed into hi-tech killing machines. As an army of elite soldiers, you will travel through different simulated war zones to reach the corrupt central computer and finally put an end to the hostile system once and for all. Alex Kidd in Miracle World and Gain Ground are now individually available on the Nintendo Switch eShop in the Americas and Europe for $7.99 with commensurate European pricing. Two more SEGA AGES titles are soon going to be available on the Switch in both North America and Europe. SEGA has confirmed that both SEGA AGES: Alex Kidd in Miracle World and SEGA AGES: Gain Ground are launching on March 28th, 2019. The titles saw release in Japan awhile back, but soon enough it'll be our turn to get in on the action! 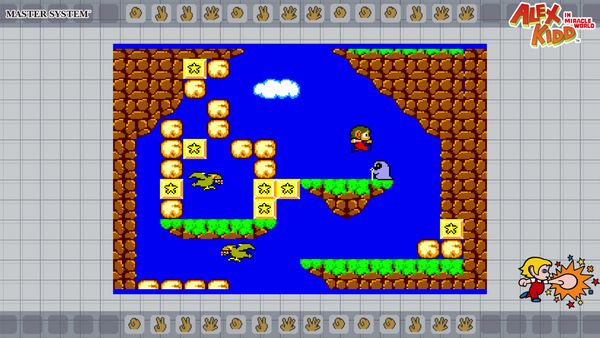 In addition to “Original Mode,” where the original version can be played without change, the Sega Ages release adds a new “Ages Mode.” Ages Mode offers the same fun of the original version, while adding support for FM Sound Unit background music, allowing players to enjoy numerous tracks in nostalgic frequency modulation. SEGA has confirmed that SEGA AGES: Alex Kidd in Miracle World will release on Switch in Japan on Feb. 21st, 2019. When the game was first announced, the only new feature we had details on was the Rewind feature. Now SEGA has shared details on 'Ages Mode,' which you can read about below. Additionally, the “Continue” feature after getting a “Game Over” has been simplified and a helper feature has been added to rewind gameplay up to five seconds, making the game more accessible for players who might not be good at action games. And with the addition of newly drawn event images at the start of important stages, and the in-game implementation of the Sukopako Motorcycle theme, “phantom background music” recorded for the soundtrack but not used in the game, Ages Mode aims to be original game in its complete form. Your next SEGA AGES title for Switch has been revealed. 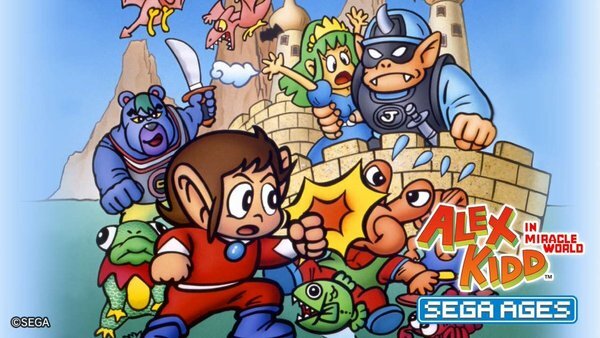 SEGA has confirmed that SEGA AGES Alex Kidd in Miracle World is going to be the next title in their series. We know that the game will cost 1,000 Yen, and is going to include a special rewind feature. 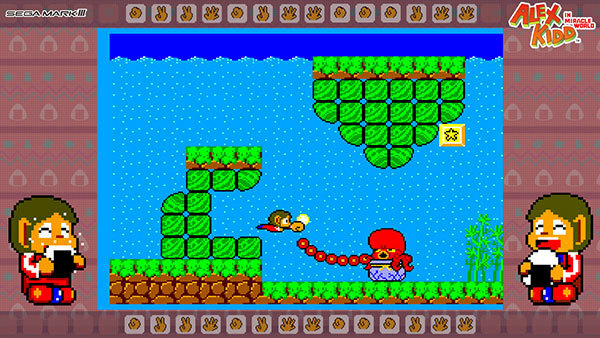 More details on SEGA AGES Alex Kidd in Miracle World will come at a later date, but for now, you can check out more screens here.